Wales coach Warren Gatland is the "leading contender" to be British and Irish Lions coach for next year's tour of New Zealand. Gatland coached the Lions to victory over Australia in 2013. Joe Schmidt led Ireland to Six Nations titles in 2014 and 2015 and is a likely challenger to fellow Kiwi Gatland. Lions chief executive John Feehan said: "It would be absolutely ludicrous of me to say that Warren would not be the leading contender - he clearly is." Talking to Sky, Feehan added: "If he is involved it will be a third tour for him, he has a record that is pretty much second to none in the northern hemisphere and so he has to be the leading contender." Since Gatland took over as Wales coach, they have won three Six Nations titles and two Grand Slams. Gatland took a sabbatical from his Wales role in 2012-13, leaving assistant Rob Howley to oversee their Six Nations title win that season. 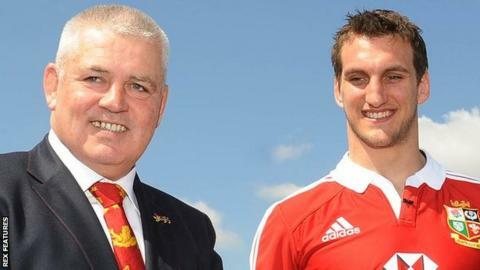 The Wales coaching duo had also been part of Ian McGeechan's assistants when the Lions lost 2-1 to South Africa in 2009. Beating the Wallabies was the Lions' first series win since the 1997 tour to South Africa, also coached by McGeechan. Feehan says the home nations coaches "are a pretty good starting point" for 2017 Lions coaching contenders. However, as a recent appointment to the England role, ex-Australia and Japan coach Eddie Jones would seem an unlikely choice. New Zealander Vern Cotter took over as Scotland head coach in 2013 and is also seen as an outside bet to guide the Lions against former Wales coach Steve Hansen's World Cup holders. "The four home-based coaches are a pretty good starting point," added Feehan. "It is unlikely that we will move outside of that, but we will keep an open mind. "We will consider any international coach who wants to be involved." The 2017 tour manager John Spencer says appointment will be made after the four home unions' 2016 summer tours. Spencer toured New Zealand with the 1971 Lions, the first to win a series, and the former England and Lions centre indicated the successful candidate would again be expected to take time out from his national role to lead the Lions. "We would expect them to give 100% of their time to the Lions," said Spencer. "That would be the best preparation and we are looking for best principles."